Glacier National Park is known as the "Crown of the Continent" with good reason. It is one of the most scenic and awe-inspiring places on earth. 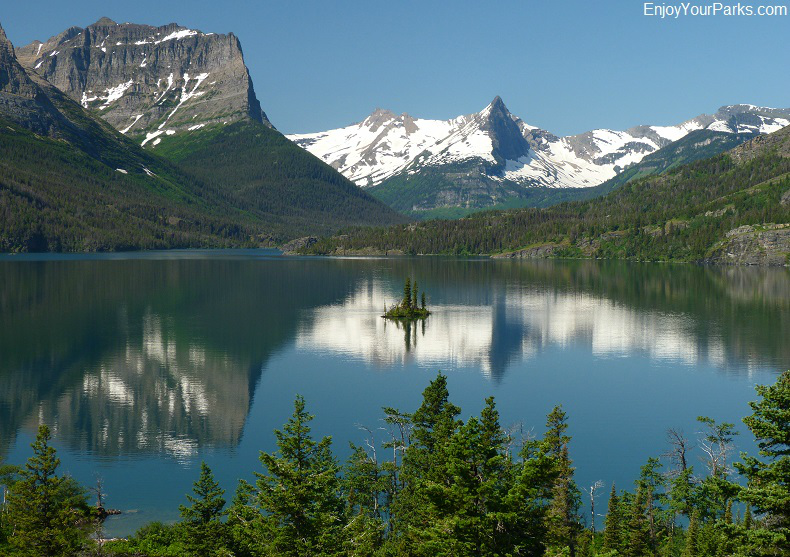 Located in the northwest corner of Montana, this world famous national park has over 200 named peaks, 762 lakes, 200+ waterfalls, 563 streams, 25 alpine glaciers, 745.6 miles of maintained hiking trails and a remarkable diversification of animals and plants. Millions of people from all over the world visit Glacier National Park each year, and is one of the major tourist attractions in the state of Montana. 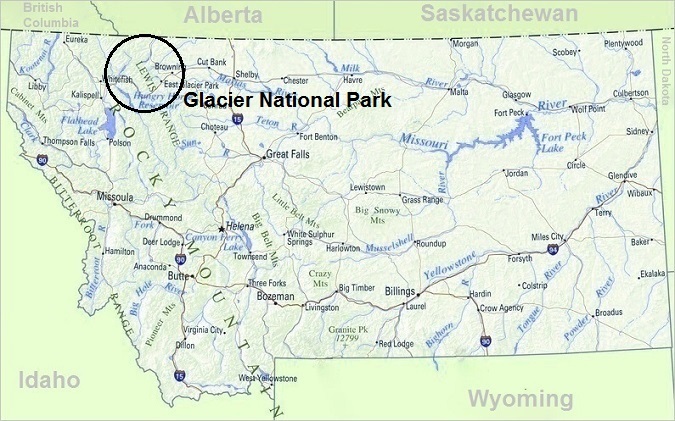 Of Glacier Park's 1,583 square miles (over 1 million acres), 94% of this remarkable national park is managed as wilderness. Within the boundary of Glacier National Park Montana, two Continental Divides Intersect at the summit of Triple Divide Peak. This unique spot is the only place in North America where this occurs. If you poured a bucket of water on the summit of Triple Divide Peak, a third of the water would end up in the Atlantic Ocean at the Gulf of Mexico, a third of the water would end up in the Pacific Ocean, and a third would end up in the Arctic Ocean at Hudson Bay. And because of this intersection of Continental Divides, the animal and plant life is more diverse than any other area in North America. The Going To The Sun Road in Glacier National Park Montana is one the great civil engineering marvels in North America, and is without question one of the most scenic highways on earth. To The Sun Road is the only road that runs completely through the park. This 52 mile long highway takes visitors up and over the Continental Divide, and exposes all who travel it to jaw-dropping vistas and magnificent scenery. 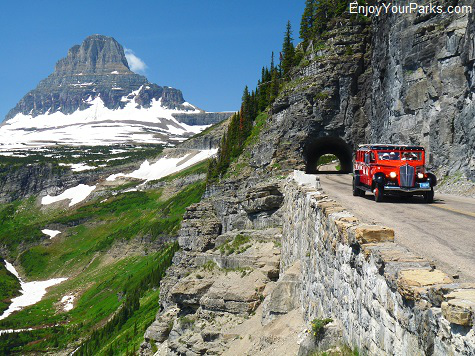 The Going To The Sun Road is undoubtedly the premier "Thing To Do" in Glacier National Park. Click here to learn all about the Going To The Sun Road. scenery along these Glacier Park Hiking Trails is magnificent. Once you begin hiking in Glacier Park, you're gonna get hooked, and you'll find yourself hiking farther and higher than you every thought you'd experience. 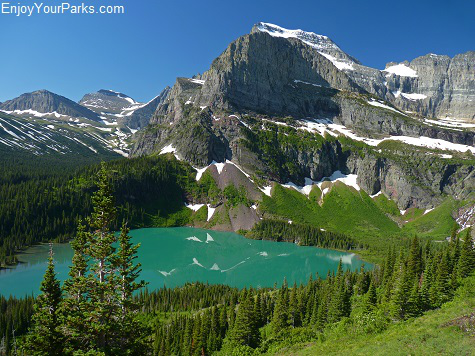 Click Here to learn all about Glacier Park Hikes. The Great Northern Railway played a huge part in the "building" of Glacier National Park. There are several world famous lodges and two backcountry chalets that were built by the Great Northern Railway in the early 1900's, and are still today welcoming visitors through their historic doors. For all the details on Glacier National Park, we have created an entire section on our national park vacation website devoted to showing you exactly where to go, what to do and where to see animals in this world famous park. 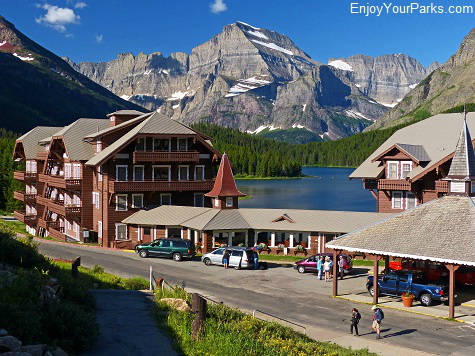 Click Here to learn all about Glacier National Park.